Times of Zambia | Incredible hair! •LISTER Phiri during the interview at her home recently. Picture by CHUSA SICHONE. 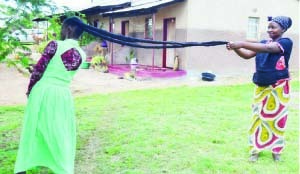 WHILE others have gone to the extent of wearing hair extensions to lengthen their hair, she is one of the few Zambian women blessed with incredible length of hair. 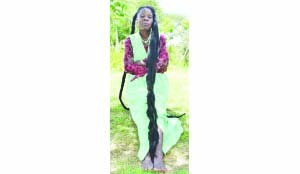 Such is the story of Lister Phiri of Chilanga District whose hair is almost twice her height. Born in 1969, Ms Phiri, who is now a mother of two, has had incredibly long hair from as long as she can recall. Because her hair has always been longer than that of her peers, often times she wondered why she was different. During her days at Kaoma High school, Ms Phiri was forced to cut her hair about four times in a year in order to maintain it within what could be described as acceptable lengths. Asked on the source of her ‘abnormally’ long hair, Ms Phiri believes that she could have inherited it from her from her grandmother and, whom she says also had extremely long hair. She explains that she is now tired of having to constantly cut her hair in order to keep it within what may be viewed as acceptable lengths, but she opts to let it grow. “After I saw that my hair was growing longer, I began to embrace it because I realised that it might be God given and probably Samson power, “she said. The cost involved in maintaining the hair using shampoo has become too much for Ms Phiri, thus resorting to using detergent paste for washing it, because it is more affordable. Ms Phiri, whose hair measured about one and half meters in 2007, says she constantly trims the edges to enable her comb it without much discomfort. She confessed that she has never used any artificial means to make her hair grow. “I have never used any chemicals to make my hair grow not even relaxing creams in my life, I have maintained natural hair from the time I was young and only use Vaseline and detergent paste to wash my hair, and style it with cotton thread,” she explains. •Lister Phiri (left) with her neighbour showing off the length of her hair. Picture by CHUSA SICHONE. She has to trim her hair frequently; it does not bother her because the hair grows at a fast rate. Ms Phiri style her hair with assistance from neighbours and her children using cotton thread, without necessarily having to spend a lot of money and time in hair salons. Despite being blessed with long hair, she has, however, endures the weight when the hair is left unbraided, which she said is laborious to bear. Ms Phiri has to endure further when her hair is soaked by the rains, making it a heavier burden for her to bear. She spends about three hours to make ponytails, which she then folds around her head, in order to allow her move freely without much difficulty. When left unfolded, the length of her hair reaches the ground, much to the amazement of many women who are left speechless at her natural endowment. Contrary to wide misconceptions of her origin owing to the length of her hair, Ms Phiri says she is a Zambian by birth and descent. “A lot of people think I come from Jamaica or some other foreign country, but the truth is that I am Zambian from the Eastern Province,” she said. Working on the principle of God only giving to people within their means, Ms Phiri believes that God has granted her the wisdom on how to maintain what others may see as abnormal. “This is my gift from God and I need to cherish it considering that very few women are blessed with such long hair,” she says. She believes that if she had not been cutting the hair over the years, she would have had hair stretching beyond the current two meters. With this very rare gift, she is hopeful that she could be considered for the Genius Book of Records.